"Octopus is an incomparable treat. I love it grilled, in a salad or in tomato sauce. For many, cooking octopus may seem daunting - but I assure you, it couldn't be easier. Serve this dish with hand-cut french fries or with rice. Never add water; you want the octopus to cook in its own juices for best flavor." Place the octopus pieces into a large saucepan. Cover, and cook over medium-high heat until the octopus has released its juices, 10 to 15 minutes. Uncover, and continue simmering until the liquid has reduced to 3 to 4 tablespoons, 20 to 25 minutes. Drizzle the octopus with olive oil, then stir in the onions and bay leaves. Cook and stir until the onions have softened, about 10 minutes. Add the tomatoes, salt, and pepper. 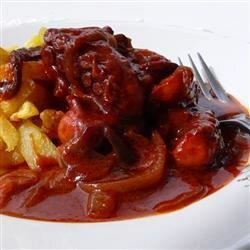 Reduce heat to medium-low, cover, and simmer until the octopus is tender and the sauce has thickened, about 25 minutes. Cook uncovered for the last 10 minutes if the sauce is too thin. I can't wait to try this, it sounds like something I had at a party years ago. Thank you so much! Pretty good. but a bit salty. Goes nicely with rice.I would make it again. Best octopus recipe I've tried. It was so delicious the kids fought over the remaining portion. Even my less than adventurous wife raved about it. Made it for dinner tonight. I thoroughly enjoyed it and it came out better than I had expected for something simple. I think patience was the key ingredient. It came out so good. The octopus came out tender.